The National Endowment for Democracy (NED) has awarded the Democracy Service Medal to the revered Crimean Tatar leader Mustafa Dzhemilev in recognition of his lifelong struggle to defend the rights of the Crimean Tatars. NED president Carl Gershman presented the medal at an event on Thursday, May 24, 2018 at the Endowment’s Washington, DC office. 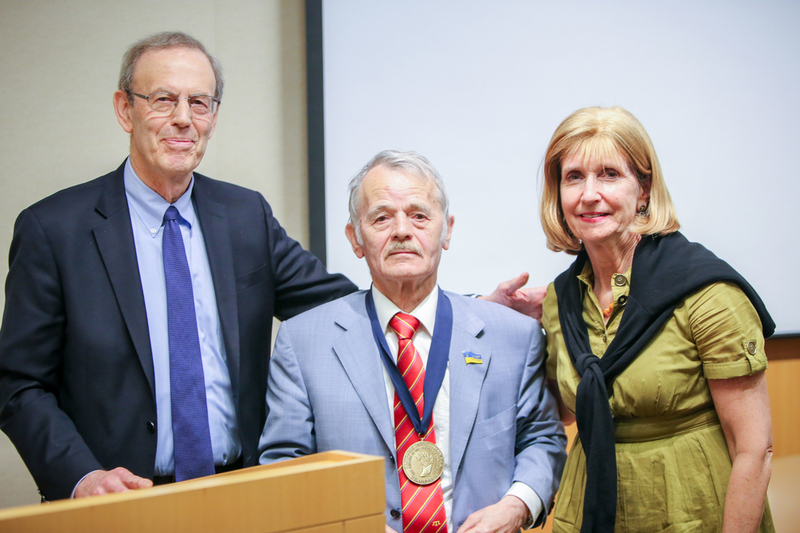 “In recognition of his spiritual strength and devotion to the cause of democracy, and for his unyielding defense of the human dignity and national integrity of his people, the Crimean Tatars, the National Endowment for Democracy is proud to honor Mustafa Dzhemilev with its Democracy Service Medal,” said Gershman. Dzhemilev, a renowned human rights activist and Soviet dissident, campaigned for the right of return of the Crimean Tatars following their deportation under Stalin. As a result, he spent 15 years in prison camps in the USSR and undertook what remains the longest hunger strike on record – 300 days. Since 2014, Dzhemilev has served as Commissioner of the President of Ukraine for the Affairs of Crimean Tatars. Since the Russian invasion of Ukraine and the annexation of Crimea, Dzhemilev and the Crimean Tatars face renewed persecution. The Russian annexation has been accompanied by numerous human rights violations, including beatings and kidnappings of civic activists. Crimean Tatar activists such as Dzhemilev have been singled out for persecution. Following Andrews remarks, the documentary Mustafa, produced by NED grantee CrimeaSOS, was shown. The biographical film was followed by a conversation between Dzhemilev and Paula Dobriansky, former Under Secretary of State for Global Affairs and current Senior Fellow at the Future of Diplomacy Project at Harvard University’s Kennedy School. A recording of the event is available on the NED website. The Board of Directors of the National Endowment for Democracy created its Democracy Service Medal to recognize individuals who have made significant contributions to the progress of democracy around the world. It has been presented to more than 30 outstanding individuals who have demonstrated through personal commitment, their dedication to the advancement of freedom and human rights, and to the building of democratic institutions. The National Endowment for Democracy is a private, nonprofit, grant-making organization created in 1983 to strengthen democratic institutions around the world. It is active in more than 90 countries, supporting grassroots, democratic initiatives. Contact: Jane Riley Jacobsen (202) 378-9604 or jane@ned.org.